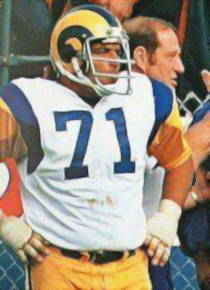 One of the NFLs unsung heros during his 15 years as an LA Ram. 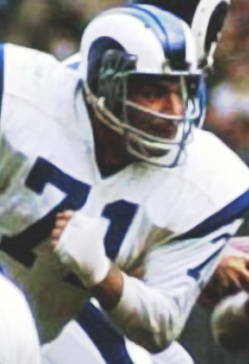 An American International College attendee, he was drafted in the 10th round by both the Rams and the New York Titans in 1961. 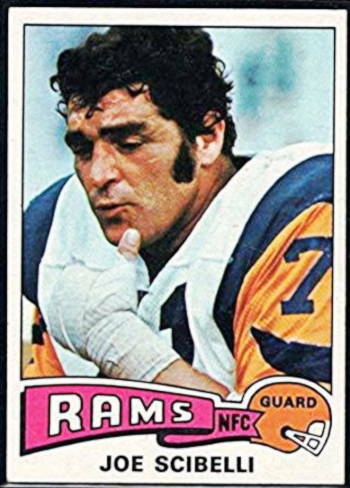 His 202 games played still ranks #4 on the Rams All-Time Games Played List. 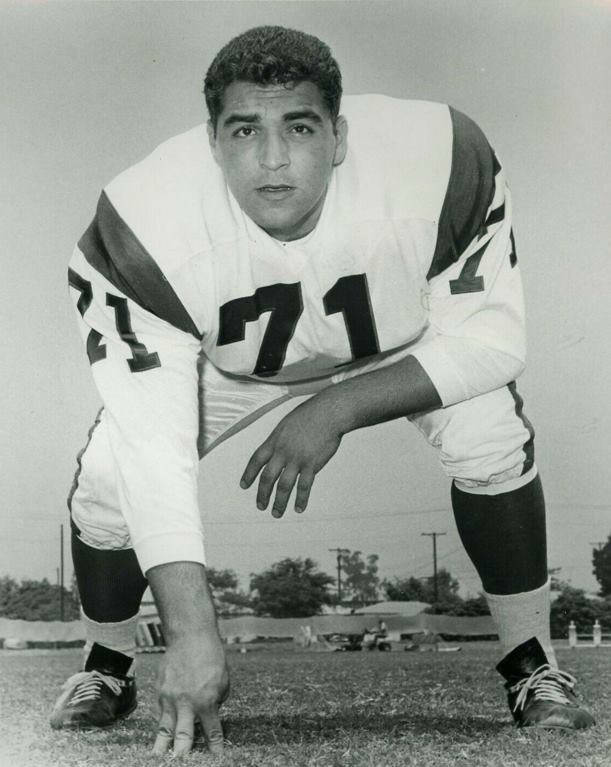 5 times selected as the Rams Outstanding Offensive lineman of the year by the teams Alumni Association. 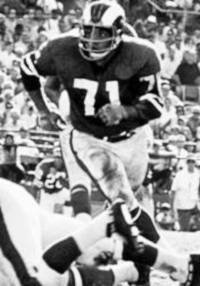 A Pro Bowl player in 1968 and 2nd Team All Pro selection in 1973. 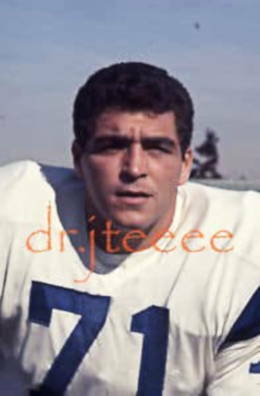 He passed away in 1991 from cancer. 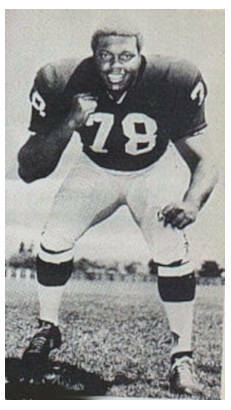 Remembered by many team mates as one of the most likeable players they ever knew. 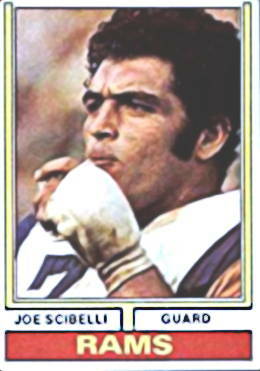 Joe Scibelli relaxes a bit during a game. 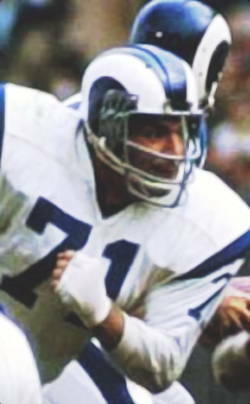 15 year Veteran Offensive Lineman for the Rams from 1961 to 1975. 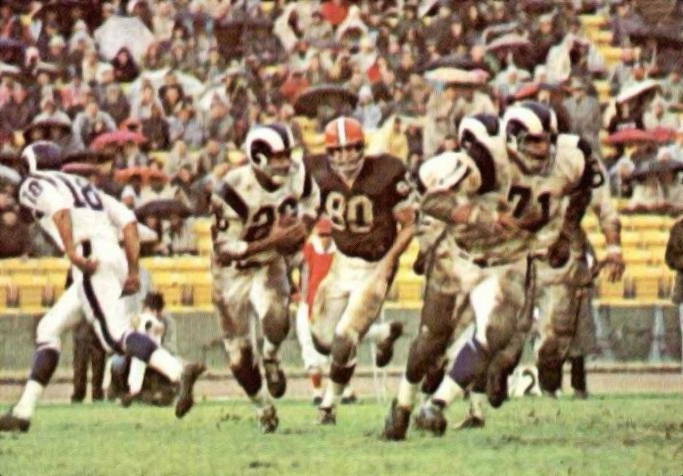 Action from the Rams and Browns match-up in 1965 played at Los Angeles Memorial Coliseum. 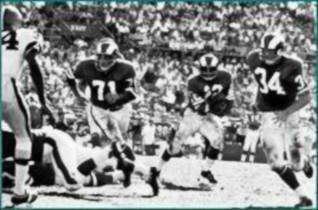 Willie Brown (#26) takes a handoff from Roman Gabriel (#18) as Offensive Guard Joe Scibelli (#71) gets out in front to block. 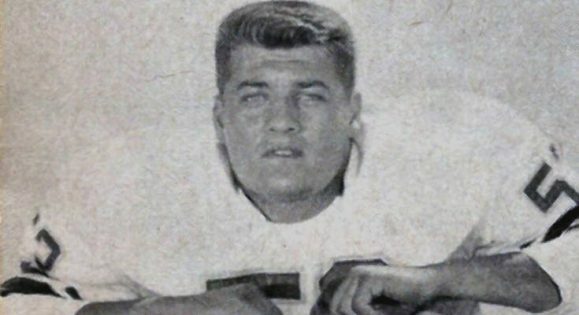 Pro Bowler Bill Glass (#80) of the Browns looks on from the distance. 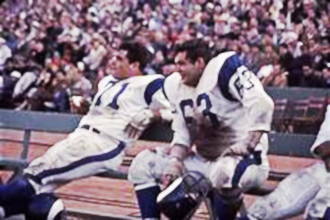 In 1965 the Browns were riding high to an Eastern Division Title, finishing the season with an 11-3 record. 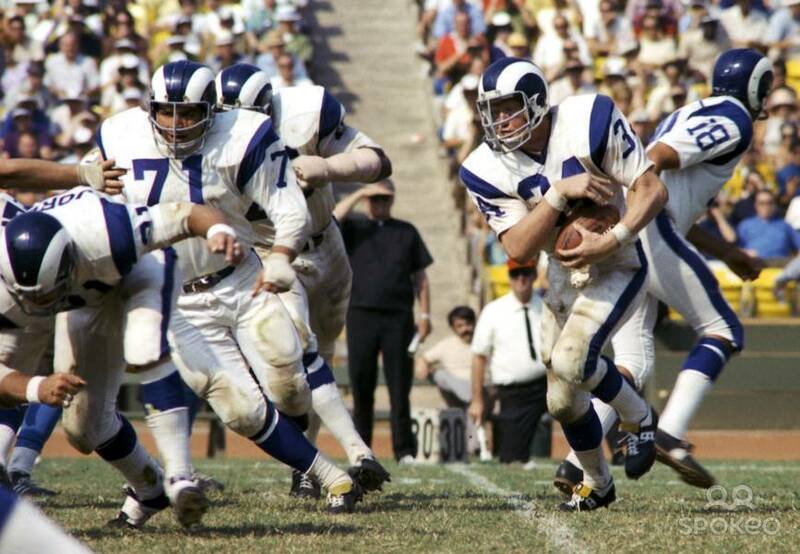 But one of those 3 losses was a 42-7 thrashing against these Rams pictured above. 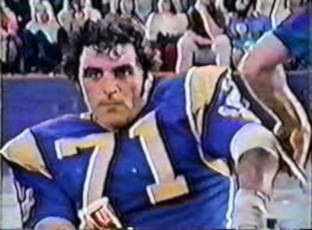 Roman Gabriel had a career day passing for 323 yards and 5 touchdowns while running for another. 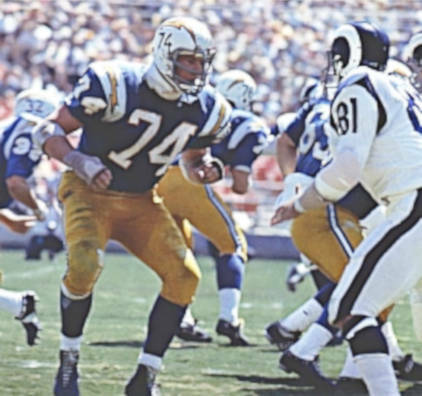 2 Pro Bowl Offensive Lineman of the Los Angeles Rams in 1968 - Joe Scibelli (#71) and Joe Carollo (#63). 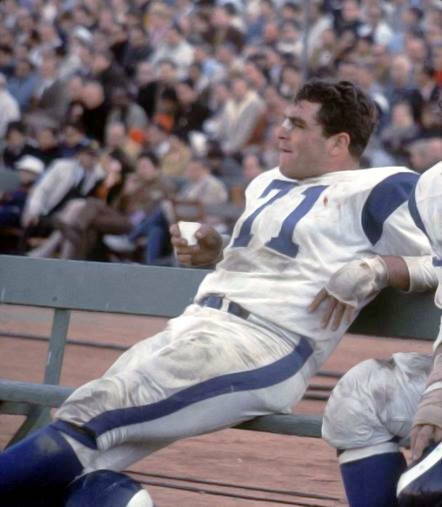 The Rams offensive ranked #1 in Total Yards that year. 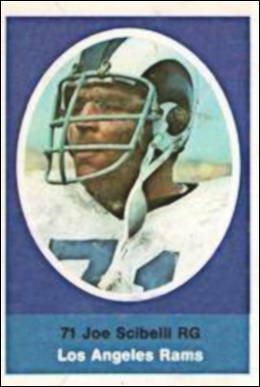 His Toppd trading card from 1975 - His 15th and final year in the NFL. 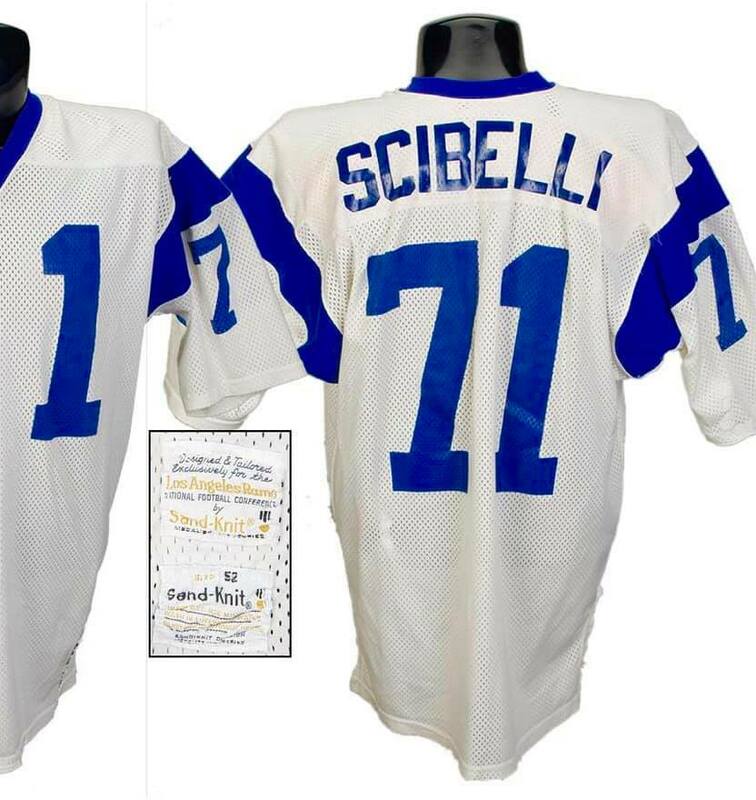 The long-time offensive lineman of the Los Angeles Rams, #71 - Joe Scibelli. 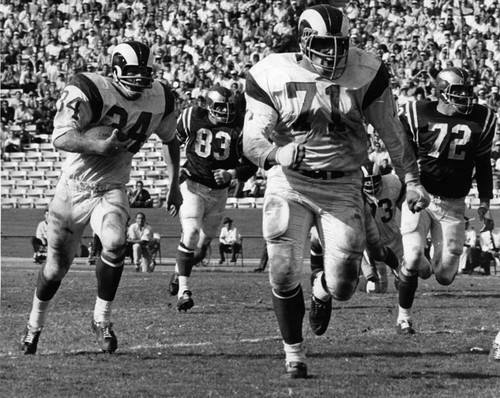 Played 15 seasons and 204 games for the Rams earning both Pro Bowl and NFL All Pro Honors during his time. 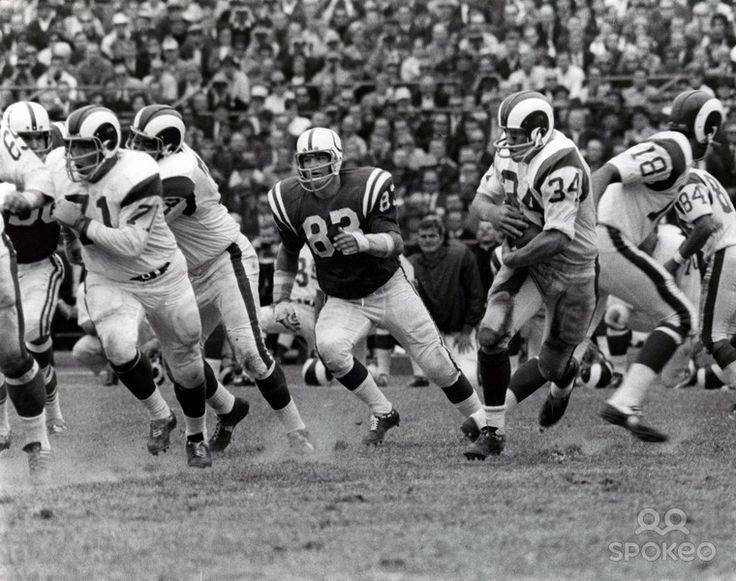 Pulling out to block for Rams runner Les Josephson as Colts linebacker Ted Hendricks (#83) is in hot pursuit. 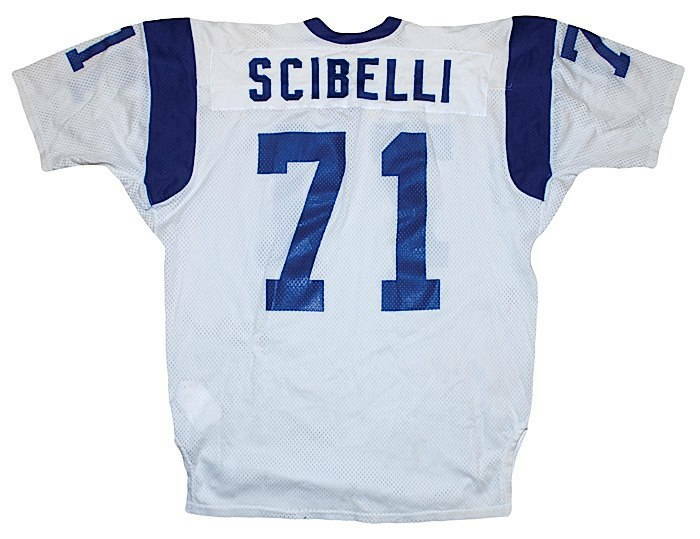 Jersey of the long-time offensive lineman of the Los Angeles Rams. 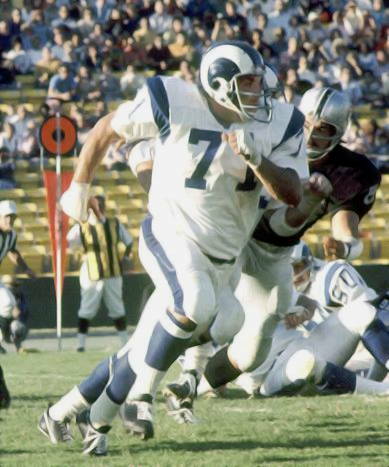 Nice promotional picture of Joe Scibelli, the 15-year veteran offensive lineman who played for the Los Angeles Rams. He died from cancer in 1991.